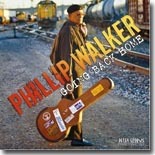 Gulf Coast blues vet Phillip Walker is out with one of his strongest CDs in years. Going Back Home on Delta Groove Records is our Pick Hit this month. Ruf Records is again teaming up three of their artists. This year, Sue Foley, Deborah Coleman and Roxanne Potvin combine forces for the guitar-centric Time Bomb, this month's Surprise CD. Paul Reddick is now best known for his song used on a Coca-Cola commercial, but you'll hear much more on Reddick Revue, a retrospective of the Canadian bandleader's career. The NorthernBlues release is featured in this month's Flashback section. Our What's New section features a wealth of new releases, including discs from Candye Kane, The Beat Daddys, Billy Jones, Eli Cook, Billy Gibson, Boyd Small, Mem Shannon, and Adam Posnak, plus reviews of a trio of blues-related DVDs including the excellent Hurricane on the Bayou and an inside look at the late Carey Bell.